Learn about the temperament and personality of the Vizsla. Discover what he's like to live with, his traits and characteristics and how he generally behaves. And look at lots of Vizsla photos. The Vizsla has earned the nickname the "Velcro dog." Owning a Vizsla is a lot like having an extra shadow. He will follow you wherever you want to go, whether it's out of town or into the kitchen. He will almost certainly accompany you to the bathroom. And he will have to be touching you when he is lying down. He will probably try to sleep with his head on your pillow. The Vizsla is remarkably affectionate, and not afraid to show it in public. Be prepared for big kisses along with the Vizsla hug -- two paws around your neck. The breed originates from Hungary, and there is an old Hungarian saying: If you own a Vizsla, he lives on your head. 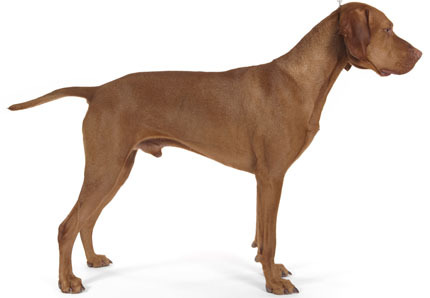 The Vizsla is an ideal companion for a very active person with a very active lifestyle. The Vizsla needs lots and lots (and lots) of exercise. You will need to let your Vizsla run for at least an hour each day, rain or shine. The Vizsla is very bright, and like many breeds, he needs a job to do. For this reason, he excels in formal competition. But even if you don't want to go this route, you will need to come up with something for your Vizsla to do, as he will crave mental stimulation. They excel at flyball, agility, and Frisbee. They make great jogging companions and they love to swim. If they do not get the exercise they need, they will act out and misbehave. They will eat anything: pantyhose, shoes, rocks ... and are famous for needing surgery to clear intestinal blockage. They also hate to be left alone, so they are not ideal for a person who has to work long hours away from her dog. They are great with well-behaved, respectful children, though are often not fond of toddlers. They have been known to knock over a two-year-old in order to steal a toy. They are known as the "Versatile Vizsla" in the hunting world because they can do it all: hunt, point, and retrieve. They can also do it all as a pet. They are bright, capable, and curious animals with an uncanny ability to respond to training. Although be prepared, a Vizsla continues to act like he is a puppy until he is about four years old. Vizslas will alert you with a bark should someone be on your front steps. Of course, once you let the person in, your Vizsla is liable to greet them with a wagging tail and two paws to the stomach. The Vizsla is very intelligent and easy to train. He learns new commands very fast. The Vizsla sheds a fair amount of hair. You'll find hair stuck to your couch, carpets, clothes and everything else in your home.